Today at Apple’s headquarters, CEO Steve Jobs took the stage to address the issues surround the iPhone 4 antenna. How did he do that? With numbers. Jobs rattled off some key numbers about how the iPhone 4 is doing overall since its launch three weeks ago. The gist? Compared to the iPhone 3GS, which Jobs noted is the most successful smartphone ever, the iPhone 4 is basically doing even better. Complaints to Apple Care are extremely low, returns are down, and the amount of calls dropped is up — by less than 1 call in each 100. According to Jobs, 0.55% of all iPhone 4 users have called Apple Care to complain. Yes, one half of one percent. What about AT&T return rates? If people are having a major problem with the antenna, they’re going to return it right? Well, they’re not. The iPhone 3GS had a return rate early on of 6% — which Apple was very happy with. With the iPhone 4, that return rate is 1.7%. The return rate is one-third of what it was for the iPhone 3GS. Finally, Jobs mentioned the drop call rate. In this case, Jobs admitted it was higher than with the iPhone 3GS. How much higher? According to AT&T, the iPhone 4 is dropping less than one more call per 100 calls when compared to the iPhone 3GS. And while it’s only slightly higher, Jobs has a theory as to why this is. He thinks that because the iPhone 3GS was the same form factor as the iPhone 3G, there were a ton of cases available out there for it at launch. In fact, 80% of people who bought an iPhone 3GS at Apple stores left with a case, he says. The iPhone 4 is a new form factor, so there aren’t a lot of cases out there yet. And so only 20% of people who buy iPhone 4 are leaving with a case. Jobs says he isn’t sure that’s the reason for the bump in dropped calls, but that’s what he believes. So it should be no surprise that Apple is giving away cases for free to iPhone 4 users from this point on. 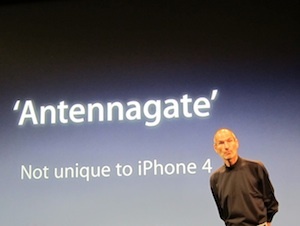 “There is no Antennagate,” says Jobs.